TSPSC TST 2017 application form, ts tst apply online 2017 : Telangana State Public Service Commission (TSPSC) will be issued TST application form 2017 in the month of August 2017. So candidates can check tspsc teachers selection test application details through this article. Candidates who want to apply tst then go for eligibility criteria if he/she satisfied eligibility rules prepared by tspsc then go for apply. 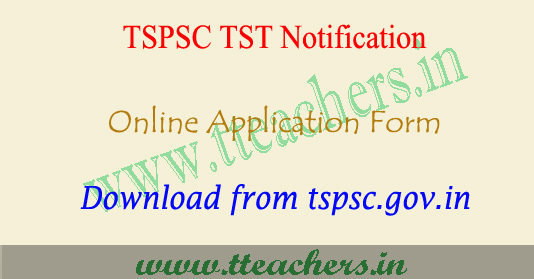 TSPSC TST online application form 2017 will be available on tspsc website it is tspsc.gov.in. Candidates can get the TSPSC TST Application Form through online mode only. The application form is available from the August 2017. Last date to fill the application form will be the Sep 2017. There will be no provision to submit and fill the application form through offline mode.